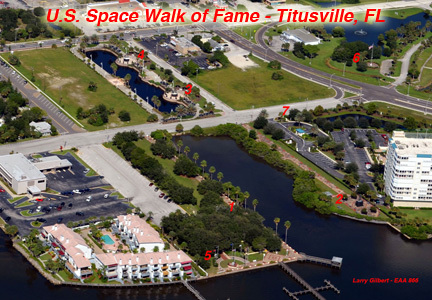 The Veterans Memorial of Titusville is located next to the U.S. Space Walk of Fame. This memorial, dedicated to "All Veterans of All Wars," consists of an 80-foot Circle of Memories. It is comprised of ten granite monuments which are dedicated to our nation's major conflicts from the American Revolution through the Viet Nam War and includes Desert Storm. The Peace Monument is the first monument you encounter at the entrance to the circle. On the other side are our memorials to the Tuskegee Airmen and the S.S. Leopoldville tragedy. Over 2,550 memorial bricks have been placed at the circle of memories. In the entrance walk are bricks identifying each student who has received the Veterans Memorial Scholarship. On the waterfront is our circle of flags. In the center flies Old Glory. It is surrounded by the service flags of the Army, Navy, Air Force, Marine, Coast Guard, and Merchant Marine. Click here for the Veterans Memorial brochure with brick application. View a gallery of Veterans Memorial photos. ... is an all volunteer non-profit organization dedicated to creating and maintaining the nation's first veteran's memorial honoring all American veterans (men and women), and recogizing all commissioned military engagements, beginning with the Revolutionary War through the Gulf Conflict. The monument will serve as an educational focal point for educational field trips. It offers a place where all of our great conflicts and the role of each of the services can be explained. Volunteers from the Veterans Memorial Foundation can be available to guide and answer questions. The Veterans Memorial Scholarship Fund provides annual scholarships based on students needs and desire. A brick is placed at the entrance to the circle remembering each student who receives our award. 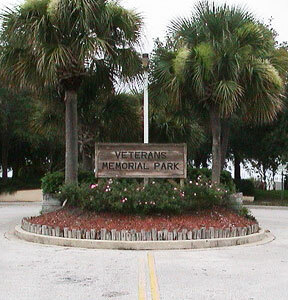 This Veterans Memorial is now overseen by the Titusville Flag & Memorial Foundation. For information, contact Bob Socks at 321-848-1630 or bobbysocks@cfl.rr.com.